It was like that for me, anyway, back in 2011-2012 when I started to question Beth Moore’s teaching. The church I attended at the time was Southern Baptist in denomination, tradition, and church practice. The members were sweet and they loved Jesus and they were faithful. They had a blind spot about Moore, though. Her lessons were continually used in the Ladies Ministry, and I saw Moore’s books were cradled in more than one woman’s arms as we went about our church-activities. I was graciously brought to a ladies retreat where the DVD of “The Hairbrush Story” was exegeted. I was also invited to a weekend Living Proof Live event. That was my first exposure to Moore, having been a recent convert and a transplant from the North, where women who wore flannel and LL Bean boots looked at women who said ‘honey’ & ‘y’all’ and wore hairbows with a degree of perplexity and wariness. However, after the Living Proof event concluded, having listened closely to Moore’s lesson for three straight sessions, I was more than a little perturbed. When I arrived home I set to comparing her teaching (I was glad that as a journalist I’d taken copious and precise notes at the LPL event, which I still possess) to the Bible. What I was seeing in my Berean eyes didn’t measure up. But then again, I was a new convert and had just begun in church. I also looked online for credible ministries, pastors, or theologians who had also examined her work. I was a newbie after all. Nowhere could I find any critique of Beth Moore. OK, that’s hyperbole, I found two, thank goodness! Otherwise I truly would have either gone crazy (hyperbole again) or been accused of being crazy (true fact, not hyperbole). I found The King’s Dale. 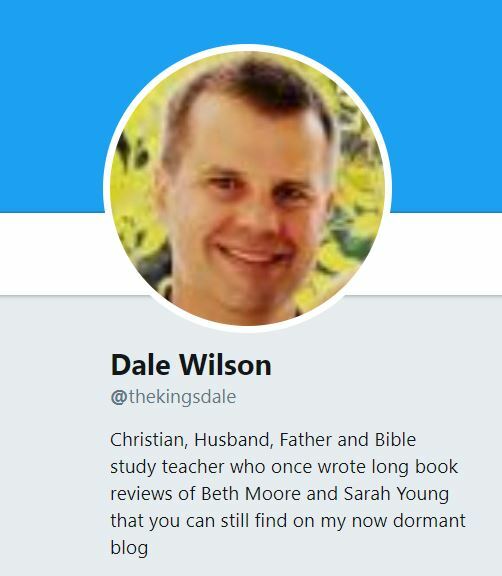 Dale Wilson ran a blog, which has since gone on hiatus, critiquing Beth Moore’s lessons and some of her books. He also critiqued Sarah Young’s book Jesus Calling. Both of these women all these years later are still in print, still cranking out more, and are still popular nationwide. Finding Mr. Wilson’s critiques saved my sanity. I was completely impressed with his work. They were objective, credible, precise, scriptural, and a relief to read. At the time, (2012-2013) there was precious little calling into question anything about Beth Moore. Reading his work confirmed my suspicions and my own research. Here are my 2011 critiques of Beth Moore, the very first time I was exposed to her, and my reactions. I just took the morning to re-read all these and I’m glad to say that my research and opinions have not changed from 8 years ago when I first wrote it. I’m grateful to the Holy Spirit for discernment, even though it’s a tough go sometimes. I never would have figured out all that on my own, especially so early in my walk. I can’t believe 8 years have gone by since my newbie introduction to just how powerful and popular a false teacher can be within the Body, but also how faithful Jesus is to His own children in opening our eyes to dangers and traps of the deceivers among us. Thank you for your faithful work and being a resource for us. I have referred many people to your critiques to help them understand. God Bless You Elizabeth.